What new releases are you looking forward to this year? Umbrella by Will Self: Shortly before Umbrella came out in the UK last September, Will Self published an essay in The Guardian about how he’d gone modernist. “As I’ve grown older, and realised that there aren’t that many books left for me to write, so I’ve become determined that they should be the fictive equivalent of ripping the damn corset off altogether and chucking it on the fire.” Umbrella is the result of Self’s surge in ambition, and it won him some of the best reviews of his career, as well as his first Booker shortlisting. 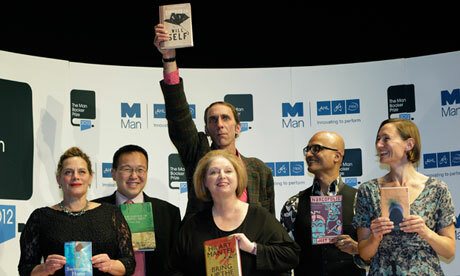 He lost out to Hilary Mantel in the end, but he won the moral victory in the group photo round by doing this. Scenes from Early Life by Philip Hensher: In his eighth novel, Scenes from Early Life, Philip Hensher “shows for the first time what [he] has largely concealed in the past: his heart,” writes Amanda Craig in The Independent. Written in the form of a memoir, narrated in the voice of Hensher’s real-life husband Zaved Mahmood, the novel invites comparison with Gertrude Stein’sThe Autobiography of Alice B. Toklas. Described as a hybrid of fiction, history, and biography—and as both “clever” and “loving”—the inventive project here is distinctly intriguing. All That Is by James Salter: Upon return from service as a naval officer in Okinawa, Philip Bowman becomes a book editor during the “golden age” of publishing. The publisher’s blurb promises “Salter’s signature economy of prose” and a story about the “dazzling, sometimes devastating labyrinth of love and ambition.” In our interview with Salter in September, he told us it was “an intimate story about a life in New York publishing,” some 10 years in the making. From John Irving: “A beautiful novel, with sufficient love, heartbreak, vengeance, identity confusion, longing, and euphoria of language to have satisfied Shakespeare.” Tim O’Brien: “Salter’s vivid, lucid prose does exquisite justice to his subject—the relentless struggle to make good on our own humanity.” April will not come soon enough. You Are One of Them by Elliott Holt: You Are One of Them is Pushcart Prize-winner Elliott Holt’s debut novel. You might be forgiven for thinking she’d already published a few books, as Holt has been a fixture of the literary Twittersphere for years. Holt’s debut is a literary suspense novel spanning years, as a young woman, raised in politically charged Washington D.C. of the 1980s, goes to Moscow to investigate the decades-old death of her childhood friend. A Guide to Being Born by Ramona Ausubel: A short story collection that includes the author’s New Yorker debut, “Atria”. If that piece is any indication, the book is more than a bit fabulist – the plot involves a girl who finds herself pregnant and worries she’ll give birth to an animal. The specter of parenthood, as the title suggests, appears in numerous guises, as does the reinvention that marked the protagonists of her novel (the genesis of which she wrote about in our own pages). Blast, this Top Ten only made it halfway through the year! There’s just too much brewing to be able to discern what will be the true standouts. For the full list, arranged by release date, head over to The Millions immediately.